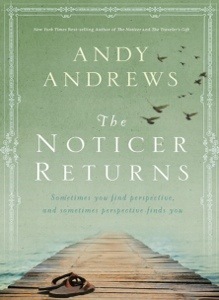 In Andy Andrews’ latest book, “The Noticer Returns”, Jones is leading a class on parenting. He asks those in attendance what the gold standard is for raising children. It ends up being a very challenging question to answer and Jones’ response will really make you think. Before I share his response with you, I would like to give you the opportunity, just as I did while reading the book, to ponder the question and see if you can form an answer. So, is there a gold standard for raising children? If so, what is it? In order to answer this question, it helps to understand what a “standard” is. According to Merriam Webster a “standard” is something that is regularly and widely used; well-established and very familiar; something established by authority, custom, or general consent as a model or example. In sports we have standards for the size of the playing fields or courts. In schools we have standards for passing class and moving on to the next grade. There are standards for how to dress in sports as well as some schools and even work. Science has all kinds of standards by which to test and proof theories. Think about all the standards in the financial world. There are endless examples of standards that we have created for ourselves and they are needed. A world without standards would lead to chaos and confusion. Everybody would just be doing their own thing and making up rules as they go. Is there a well established and widely used method of raising children that has been set by some authority as a model or example? Should we all just do the best we can and see how things turn out or is there a standard to follow? In part 2, I will reveal what Jones said in the book and then provide my own take on it. If you have read the book already, then you may have some idea where I’m going with this and the challenge that has been presented to us. If you have not read the book yet, I highly recommend it. Enter your email in the “Follow Me” link to the right and the next post, as well as all future posts, will be emailed directly to you. Looking back over 15 years of parenting so far, the following is a list of decisions that we have made concerning our kids that we believe has had the biggest impact. Here is the quick list and below are explanations of why I believe that each are important. God must be number one in our lives and we must show our kids that we believe such. That is why the first 3 keys to successful parenting deal with your faith and belief in one who is higher than us all. A great way to teach your kids the importance of God in our lives is to spend time daily with them in prayer. Pray with them before they head off to school. Pray together at dinner. A simple bedtime prayer together is also a great habit to get into with your kids. Becky and I have prayed with each of our kids at bedtime since they were babies. They look forward to bedtime prayer and if you try to skip, they’ll remind you. There is something about praying before bed that gives you and the kids peace of mind to close your eyes and sleep soundly. Dinner time is a great time to bond as a family. At our home everyone is involved in the whole dinner process, from setting the table up to cleaning up afterward. Eating together should be a daily tradition that is not skipped. Turn the TV off, set the phones and other electronics to the side and enjoy some quality time together. If at all possible, one of you should stay at home with the kids. When our first child one born, we decided that being at home with the kids was more important than making extra money, especially during the first 5 years of their life. Once they were all in school, Becky went back to work, but has always worked a job that was flexible enough to allow her to be there for the kids when they returned home from school. Your must be there for your kids. Kids grow up fast and along with growing up comes change in how they look. Enjoy the moment, but also take lots of pictures and videos. Both you and the kids will love being able to look back, when they are older, and cherish the moments that you had together. We all spend about 13 to 17 years of our lives going to school and learning just about everything you will need in life, except how to raise children. Kids don’t come with instruction manuals, so it is necessary to educate yourself in some way about how to raise kids. Read books, talk to and learn from others that have been there already, pray, read the Bible. We have learned a ton from reading books about kids and how to raise them. As they get into the teenage years you will find yourself searching for even more than when they were younger. There are many benefits of getting your child involved in a team sport. They learn how to interact with others, how to work together as a team, how to control their emotions, develop motor skills and much more. Every child should be given the opportunity to learn how to play an instrument. I can’t tell you how many times that I have heard someone say, “I wish that my parents would have made me learn…”. If your child learns how play an instrument, that is something that they can keep the rest of their lives. It’s not easy making them practice every day, but in the end both you and they will be glad for it. Your marriage will be tested many times throughout the parenting years. There will be times when you feel like giving up, but don’t. Diamonds are formed under pressure. If you can stick it out to the end, both you and your kids will be better for it. I am very thankful for my wife. There are many days, when I think about all that she does for us. How I could do it without her, I have no idea. And vise versa. Husband and wife must compliment each other and work together to make the family run. I feel for all the single parents out there and their kids. They have to be under a huge load that I cannot understand. Amongst all the hustle and bustle of life, take some occasional “time-outs”, put life on pause for a moment and enjoy some time together. Play a board game, cards, roll around on the floor with your toddlers, and get away when you can. One thing that my wife had to teach me concerning vacations was that it is all about making memories. Often times I would get all caught up in how much it is was costing. Gas, hotel, tickets and other things have a price, but memories are priceless. When you spend time together, either at home or on a trip somewhere, focus on having fun and making memories. Thank you for taking a moment your time to read this. If you feel that it was helpful to you and believe that it could benefit others, please share. If you would like to receive future articles from me on parenting, simply enter your email address in the “Follow Me” link to the right. Are your kids browsing the internet when they should be going to sleep? Are they struggling to get their chores done because of the distractions of electronics? In 2014, most everyone, including kids have their own personal device that can access the internet through Wi-Fi. It could be a phone, iPod touch, tablet, laptop, desktop PC, XBox, and now even TVs. This easy internet access makes it increasingly more difficult to control how much time the kids spend on it. Television is no longer our only concern. The solution that we have come up with for our home is very simple; we just turn the internet off. How do you turn the internet off? Simply pull out the cord that powers the Internet modem and wallah…no internet! Every week night, at about 9:30, we pull the plug on the internet, say a prayer together and get to bed. We’ll even pull the plug in the morning or in the middle of the day, if necessary. If we find the kids staring at a screen instead of doing their homework or chores you can get their attention real fast by simply pulling the plug on the internet. If they want it back… they will get done whatever it is that they need to do. Now, there still may be times when simply pulling the plug may not be enough, especially if your kids have their own internet enabled phone. In this case, you can have them turn their phone in to you. You can limit the use of the internet with anti-virus software as well, but we still find it to be easier to just pull the plug. If you have other ideas for controlling the internet in your home I would love to hear from you. Let me know how it goes, if you try pulling the plug. As parents, we set the tone for the whole day, good or bad, starting with how we wake our kids up. It is never easy getting kids up in the mornings, especially on school days, if you hope to do it without making them grumpy in the process. At the end of this article I share a method for waking my kids up that Becky and I have found to be most effective, but first I want to share with you what I have learned NOT to do. This one was doomed to work from the start because I am a horrible singer. “Rise and shine, and give God the glory , glory”, clapping my hands loudly as I sing of course. “It’s time to get up, it’s time to get up, its Monday morrrrrrrrrrrrrning”. I think I made this one up myself. Yelling is typically not intentional, but on occasion it has been what I thought was the only way to get their attention. Normally, it’s because we’re running behind, got up late or we thought the kids were up, only to find out 10 minutes before it’s time to go that they never got up in the first place. Now everyone is in a frantic rush and it’s next to impossible to have a good start to the day with this scenario. Yelling doesn’t put anyone in a good mood. I’ve tried this a few times and although it does wake them up, they instantly pull the covers over their head and just scream. This doesn’t seem to get them in the best of moods either for some reason. Let them turn their own lights on. Somehow, I really thought that this method would be fun. Who doesn’t like music right? I even went as far as to download a song on my phone just for the purpose of waking them up. You know the song from the movie Madagascar….”I like to move it move it”? Who doesn’t like that song? It was the perfect song to get up to, so I thought. WRONG! For some reason hearing this song blaring in your ear first thing in the morning is not how my kids like to be woke up. I have to admit, that I thought it was kind of fun at first, but it didn’t last long once I realized that they were not enjoying it as much as I did. Maybe a softer, more gentle, song choice would have been wiser. After all this experimenting, there is one method that we have settled on and determined to work the best. First, wake yourself up 15 to 30 minutes earlier than normal. You want to be up and ready ahead of the kids so that you can put your full focus into them. If you get up late yourself then you almost have to revert to the “Yelling” or “Turn the Lights On” method and that is never, ever fun. About 15 minutes prior to the time that you really need the kids to get up, turn a light on that is near their room, but not the one in their room. The hallway, bathroom or closet light should work. Go into their rooms, gently touch them on the shoulder and, with the softest voice that you have, simply say, “Good Morning”. They should at least shuffle under the covers a little or turn over. Now just walk away. They will not get up yet, but that’s ok. This is Stage 1 and the point is just to get them stirring. Now, go spend some time packing their lunches or getting breakfast going. Stage 2: Come back to them after about 15 minutes. This time speak to them in a normal voice, letting them know that it is time to get up. Stick around until you see them actually get out of the bed. Don’t say anything else, just stand there for a minute. Most of the time they will sense that you are there and know you mean business. Don’t let them drag things out; give them a minute at the most. If you walk away without seeing them out of bed and moving, you could come back later only to find that they have fallen back to sleep. Then you have to revert to yelling and the whole day gets off track. This method may not work to perfection at first, but if you do it every day they will eventually get used to the routine. You may even be pleasantly surprised on occasion and find them already up before you make it back for the second wake up call. Think about how you woke your kids up when they were a newborn and simply continue to treat them the same as they get older. Determine in your minds today that every day will be a good day and it all starts with me. Make it your purpose to start the day off right, by waking the kids up gently and in a good mood. How has your experience been in waking your kids up? Good or bad? Do you have another method that seems to work well? The next time you’re teen wants to get argumentative with you, ask them this question before proceeding to have a conversation with them. “Am I dealing with a 34-year-old or a 4-year-old?”. Then treat them accordingly. Don’t be afraid to tell your teen No. Although they may not outwardly express it, there may be times when they actually want you to say “No”, so that they can in turn use you as an excuse to then tell their friends, “No”. When is the last time you sat down at the dinner table and played a board game with your family? Try entertaining each other instead of being entertained by Hollywood. Teens need boundaries. Boundaries, like a fence, keep them from getting into trouble and trouble from getting in. Teens like freedom, but freedom must be earned by showing responsibility. Teach your kids good habits. Be intentional about spending time with them in prayer each day this year.